1. In a medium bowl, whisk the egg whites and salt until frothy, white soft peaks form. It's best to use an electric mixer with a whisk attachment. 2. In a large bowl, mix together shredded coconut and sweetened condensed milk. Sprinkle the sugar in as you mix. Then fold in the frothy egg whites. 3. 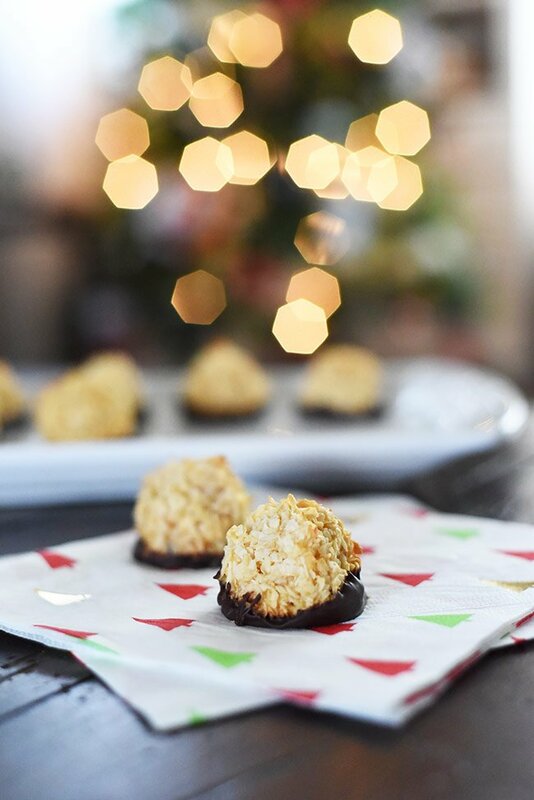 Using a small cookie scoop, tightly pack coconut mixture into a 1" ball and place to a baking sheet lined with parchment paper or a silicon baking sheet. They won't expand so you can put them pretty close together. 4. Bake on the center rack at 325˚ for about 20-25 minutes or until edges are golden brown. Remove from oven and allow to cool. 5. While macaroons are cooling, place chocolate chips in a glass bowl and microwave in 30-second intervals, stirring in between until chocolate is completely melted and smooth. 6. Take cooled macaroons and dip the bottom into the chocolate. Return dipped macaroons back to the lined baking sheet and refrigerate, or if it's cold enough, put the tray outside for about 10-15 minutes to cool and re-set the chocolate. Do these chocolate dipped coconut macaroons count as cookies? Do we care if they don’t? I mean they’re round and delicious. I think they qualify. 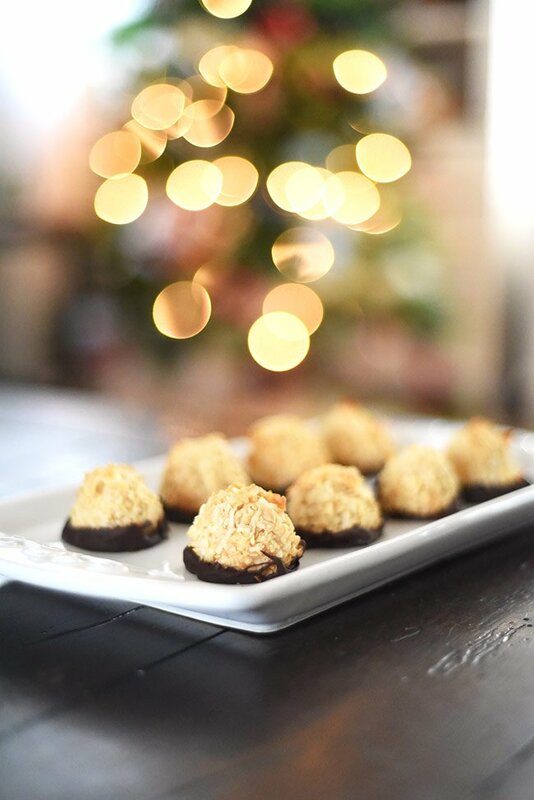 Add these coconut macaroons to your holiday baking list! Holiday cookie baking is a lot more fun now that I know a few things about cooking. My twenty-something self knew some basics but she had a lot to learn. I don’t think she knew she had a lot to learn… but she did. About cooking, about being a good friend/wife/mother/daughter, about work, about life. There have been a LOT of lessons learned in the past 10 years for this girl. A lot of them learned the hard way. (Why?? ????) Some learned through no fault of my own — the housing market crash, the Fortune 500 company I worked for went bankrupt, then the healthcare industry went into crisis mode. My timing seems to be terrible but what I’ve learned in spite of all the bad stuff that happens in life, is that there are people who will be there to help you out if you look for them and can be humble enough to accept their help. So, what does this all have to do with baking cookies? Well, I think some people believe baking and cooking in general is silly. That it’s a waste of time. Why learn to make food when you can just buy food already made? At least that’s what my twenty-something self used to think. Baking is great for stress. Slow down and enjoy this season! That was before I realized that life is not a race. It’s not all about cutting corners and being efficient to get ahead. It’s about doing something meaningful with your life. And I’m still working on figuring out exactly what that is but I get this feeling when I hand someone a box of homemade cookies and wish them happy holidays, that I’m onto something. They feel special. They feel loved. Why? Because I spent my most valuable asset—my time—on them. To me, that’s what holiday cookie baking is all about. Showing people you care in a fun, creative, and delicious way. Really feeling the holiday spirit? Try making my easy yule log cake too! Love cookies? 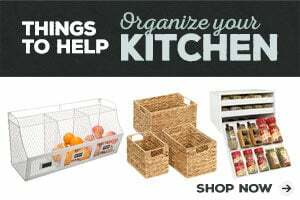 Browse my other cookie recipes and don’t forget to pin them! 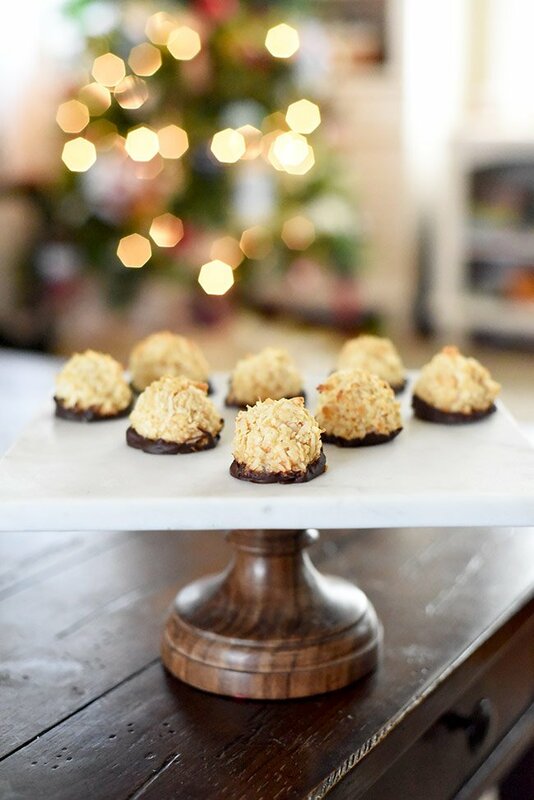 These chewy chocolate dipped coconut macaroons were featured on Inspiration Monday!